Want to remodel your home or business with elegant, versatile, and practical flooring? Then, choose tile flooring from our family business. 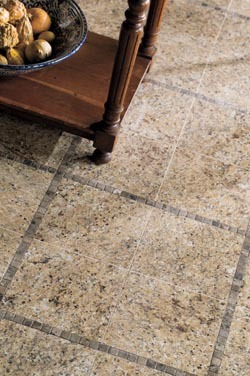 We offer tile flooring in an appealing range of types, styles, colors, and patterns. Choose tile flooring installation for any room in your house, for its beauty complements any décor and its moisture-resistant qualities are welcome in any space. Tile is easy to adapt to a number of uses. Enjoy the versatility of our tile selections for your porticos, dining rooms, fireplace hearths, and more—indoors or out. Our flooring showroom offers you a multitude of design options from slate to porcelain to ceramic tile, each offering many virtues. Talk to one of our design professionals about which type of tile would work best in your home. We possess comprehensive knowledge of different brands, such as Floorcraft, as well as types and colors of tile. Let us recommend professional installation for the floors in your home or business. Tile is tricky to install correctly, so it is a task that is best left to the professionals. We send a team of professionals with technical training and years of experience to install tile for timeless beauty and full functionality. Tile flooring installation requires precision and attention to detail. Measurements must be exact and individual tiles must be cut with a wet saw. Tile flooring sits on a bed of mortar with grouting in-between. We exercise care so the individual tiles adhere and the grouting is done neatly. Admired for its elegant appeal, ceramic tile is a little softer than its sister tile - porcelain. This makes installation more convenient for the individual tiles are easier to cut. Choose from a wide variety of designs, colors, textures, and sizes. Porcelain tile offers a modern appeal that works well with any décor. The clean lines and simple beauty of porcelain provide a subtle setting for your home furnishings. Porcelain is harder and denser than ceramic, so it offers greater water resistance and works well in extremely cold climates. For high-end flooring that offers the breathtaking beauty of natural stone, select slate tile for your home or business. This flooring is as strong and enduring as stone and resists water and stains. Slate stands up to heavy foot traffic and requires little in the way of maintenance. The qualities that make tile so attractive as a flooring option extend to its appeal as the backsplash for your kitchen. Protect your walls from splashes that occur while cooking or washing dishes with water-resistant tile. Choose a color and pattern that serve as a focal point of bright color for this room. Let us provide you with the details on the different types of tile, as well as their respective benefits. To find out more, simply call <PHONE>, or use the form to the right to reach us anytime you want!